Last Monday was a Bank Holiday in the UK and Nick and I, with our two daughters, Nicola and Louise, and grandson, Kieran, headed off to Sherwood Forest – about 27 miles away from where we live. Several events and activities are held at Sherwood during the year, some with historical themes, others with environmental or conservational ones. This weekend’s events were all distinctly historical, involving encampments and displays, and a number of short re-enactments from various groups. But I can’t bring myself to write a post about the events without first adding some information about this lovely forest – or what’s left of it – today. 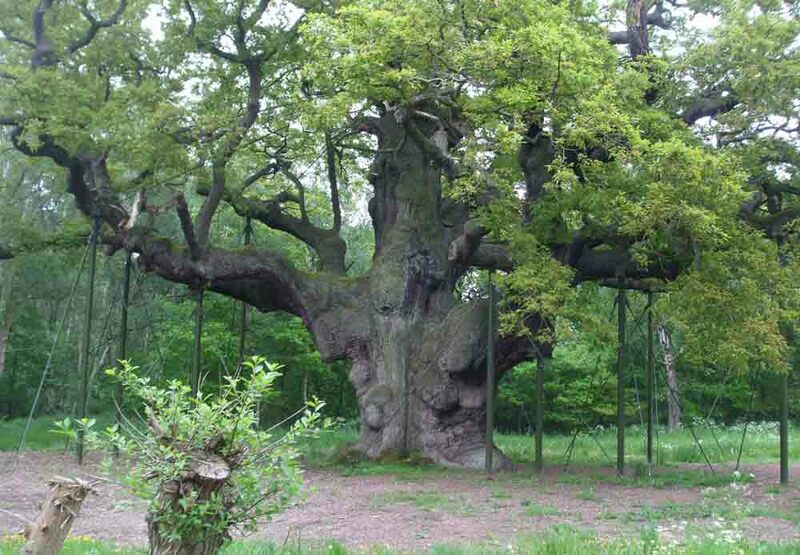 Sherwood Forest is located at Edwinstowe in the county of Nottinghamshire, 17 miles north of Nottingham. 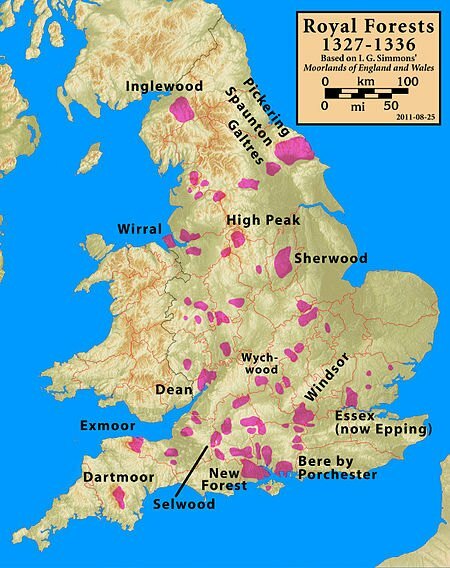 It was once an area of woodland and heath that covered 100,000 acres (156 square miles), amounting to one fifth of Nottinghamshire. It was first established as a royal hunting preserve in the 10th century, the remnants of which later became known as Birklands (originally burchlands) – so named after the birch trees growing there. Sherwood Forest is best known for its associations with one of the best known outlaws of medieval times: Robin Hood (or Robin Hode) . . .
Sherwood attracts between 360, 000 and one million visitors per year, many of them from other countries. 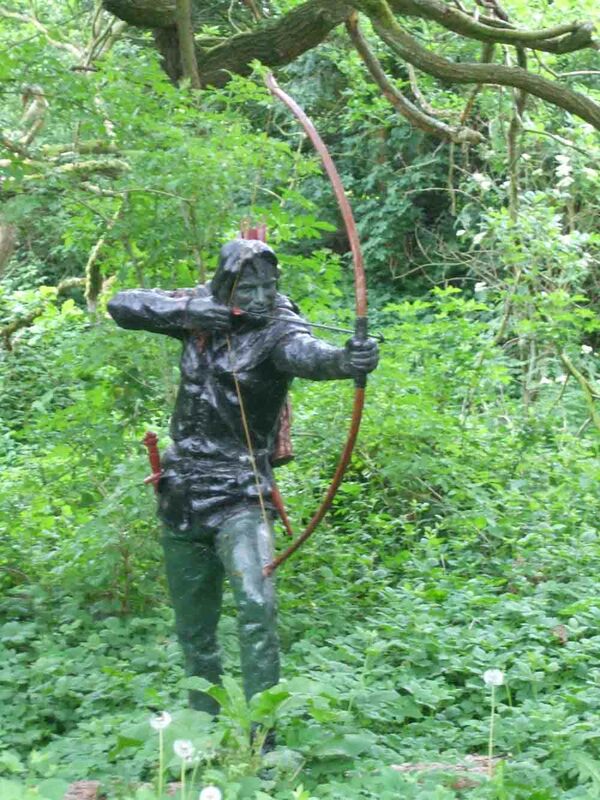 Each year, the reserve hosts the week-long Robin Hood Festival – a great event with a really medieval atmosphere and featuring the main characters from the Robin Hood legend. Entertainments include jousters, and players, plus a medieval encampment with jesters, musicians, rat catchers, alchemists and fire eaters. But visitors also come to Sherwood throughout the year to visit the Forest itself. There are over 900 ‘veteran’ oak trees here, including England’s Tree of the Year for 2014, The Major Oak – which is a pedunculate or English common oak. Naturally, other species grow here, too – birch being the predominant one. First, here are a few photos of the forest, including some of the many old oaks and some of the wood carvings dotted along the paths. I have to admit that the first tree in the gallery is my favourite. Look at those big, brawny arms – although he is rather two-faced, don’t you think . . . ? According to folklore, the Major Oak was Robin Hood’s principal hideout. It is believed to be between 800 and 1000 years old and since Victorian times its great, heavy boughs have been supported by elaborate scaffolding. Whether or not this tree really would have had a trunk sturdy and wide enough for a man to hide inside in the late 12th/early 13th century is debatable – but hey, this is folklore we’re talking about. There could well have been some oak old enough at the time for Robin to have hidden inside. I’m told that clones of this awesome tree are being attempted through grafting and acorns are also being grown. Apparently, any saplings produced will be sent to various countries around the world. Next time, I’ll post some photos of the different historical groups and characters we encountered in Sherwood on Bank Holiday Monday. It was certainly a colourful and entertaining day. 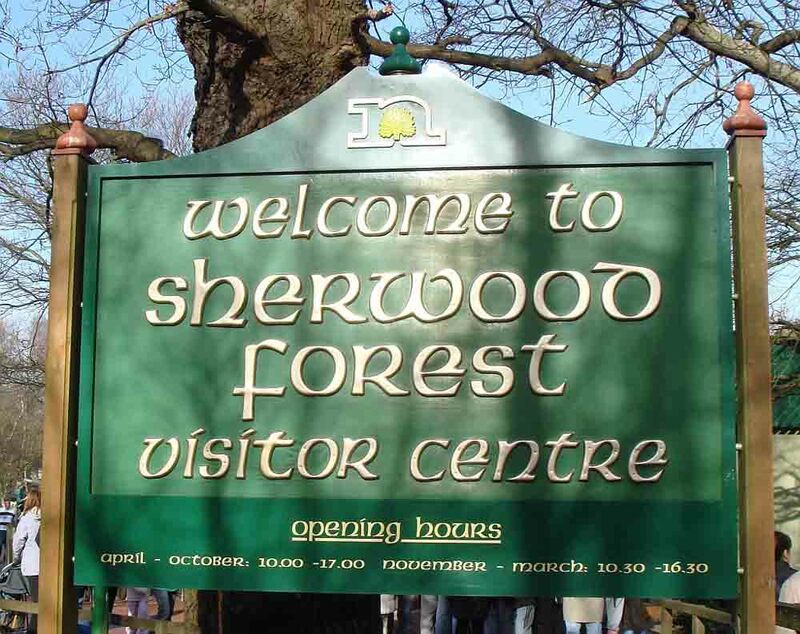 Sherwood Forest visitor centre sign. Author: Marcin Floryan. Creative Commons. What a beautiful and interesting forest! From here it feels like it must be just magical to be there. Those oaks are so old, and so very gnarled — something right out of a fairy tale! Thanks for the lovely outing. I really do enjoy your posts, they are always fun and informative and what is not to like about Robin Hood, Robin Hood riding through the glen….. Thanks, Cameron. I think I grew up loving Robin Hood. My mum always talked about him (more because of Errol Flynn than anything). Then, when I was abut nine or ten, the Richard Green series started on telly (where the song you quoted comes from). When you get up to Hadrian’s Wall, there’s a tree in Sycamore Gap (near the Once Brewed Information Centre) that featured in the Kevin Costner film. The Year 7 kids we took used to go mad to touch it! We always laughed at the fact that Robin was supposed to be on his was from Dover to Nottingham when the tree scene occurs. It was rather a big detour! 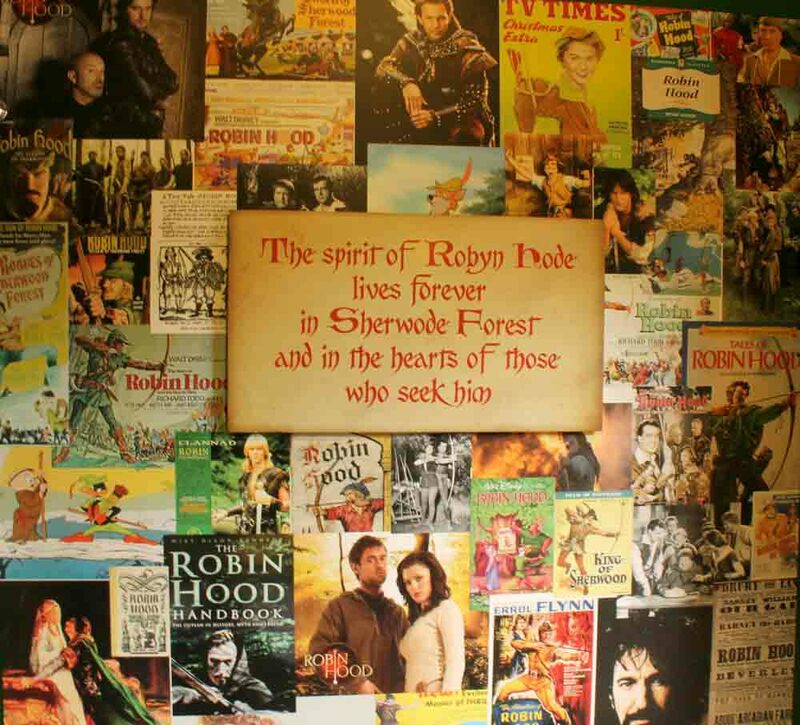 Anway, there’s lots about Robin at Sherwood Forest to enjoy. Absolutely agree! Dover to Nottingham via Northumbria!! My favourite Robin Hood film is the 1939 version with Errol Flynn. Did you know it was the first ever big budget colour movie to be made…! Basil Rathbone as the Sheriff was very dastardly too….! This is another side of Sherwood forest. Love it. Thanks for the trip. Hi Ineke. Sherwood’s a really nice place to walk around. The old oaks are excellent – especially the Major Oak. Hope all is well over there in NZ. I imagine it’s getting quite cold. Winter must be closing in by now, so keep warm. I seem to have made a typo with your name, Ineke! Sorry – I’ll edit it out! The weather here hasn’t been at all good yet. It’s been grey and very windy, and much too cold for May-June. Some areas have had really heavy rain – both here and over in France and Germany, where there were floods and lots of damage done. The weather men are forecasting a heatwave for us later this month, but I’ll believe that when it gets here. We often have very cool summers. It all depends on the weather systems coming across the Atlantic. We could have plenty of rain in summer if depressions keep coming in. We just pray for high pressures to settle over us to keep them out. Have a great weekend. I imagine it will extend into Monday, as you call it a long weekend. We had one of those last weekend when it was Bank Holiday Monday. No extra days this weekend , though. The weather here is also much like your way of explaining it. Hope for a high to move the wet or cold away! Yes it is Monday. Last long weekend until late Oct. Better make the most of it then. 🙂 We have August Bank Holiday next – another extra Monday at the end of August. Looks like a great place to visit. I’d love to see some of these places from your posts, but one thing about living in Cornwall – it’s miles from everywhere! It’s nice to see pictures of places on blogs like yours, so I can bear them in mind when planning a trip. What a cool place! This is so fascinating. I would love to visit….maybe one day 😀 Thanks for taking us on another adventure! Thanks Antonia. Sherwood’s a place I know really well. I took the children there many times when they were all still at home. We’ve had umpteen games of Robin Hood, I can tell you! Sounds fun. My kids would love it! What an amazing day! The Major Oak is my favorite. Yes, the Major Oak is quite an old man. I doubt if the heavy boughs would last long if the scaffolding came down. But it’s an impressive tree, with a huge girth. The longevity of some trees always amazes me. Hey there – lovely little bit of history on such a rich place. I was actually one of the reenactors (I was portraying a merry (wo)man) – so I’m looking forward to seeing your take on the event, and maybe catch sight of some photos of my friends? Thank you, Texan Fenris (Fascinating name. Are you very wolf-like – and are you from Texas?) I’m also wondering which reenactment group you were in. From your comment, you are a woman, but dressed as a man in Sherwood? That’s part-guess, of course, because we saw a few women dressed as men but not the other way around, especially in the king John camp and the Scots’ camp. Whichever group you were with, we thoroughly enjoyed the day and loved the reenacted scenes. 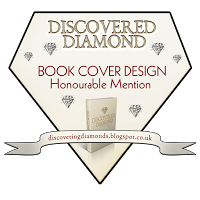 It’s a big ‘well done and thank you’ to all of you. Ha, glad you like my name. I’m indeed a native Texan, but I’m very interested in my heritage, which is primarily Scandinavian, and so I just added the Fenris for vanity’s sake. I was with Crusade – we had both the king’s men and merry men in our camp (funny to have John ignoring Robin Hood sitting a few yards away). It was a fun show to do, and I’m glad you enjoyed it. Ah, so you’re a Viking at heart! Now, /Vikings are my favourite thing to talk about, as I write about them. 😀Anyway, I noticed a few women in John’s camp, but the only one I spotted who was dressed as a man was the one who had an exciting set-to with an axe-wielding madman. Was that you? If it was, you certainly put up a good fight. I remember Danny Kaye as Robin, too. He played the part in his usual jovial way, and of course, couldn’t resist the odd song or two. He had a lovely voice, though. The story of Robin Hood appeals to most people’s imaginations, I think. I’m away from home this week, Irina. We’re down in Cornwall until next weekend, so I’ll be reading some posts after that. Our days are too packed at the moment to do anything much at all on my blog. I’ll be going home with enough photos and information for at least a dozen more posts! It’s a great old tree, that’s for sure, but think if the scaffolding were taken down, those huge boughs would break off. 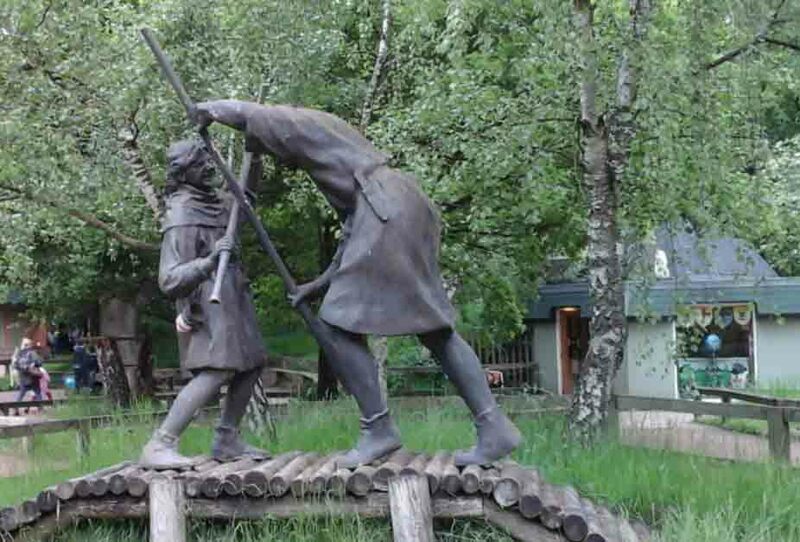 It certainly draws a lot of people to Sherwood – along with the story of Robin Hood, of course. Hope all is well with you, Clare. I’m away in Cornwall this week, but will visit your blog once I get home next weekend. Time is very short when I’m on holiday. We’re out so much I haven’t time to look at my blog on most days. This is so much fun! I used to love everything about Robin Hood when I was a teenager. I think I was inspired by his rebellious nature 😆 What I would have given to visit Sherwood Forest!